When I was looking around for methods to use spoons for cake pops, I found lots of photos of completed pops without any instructions. 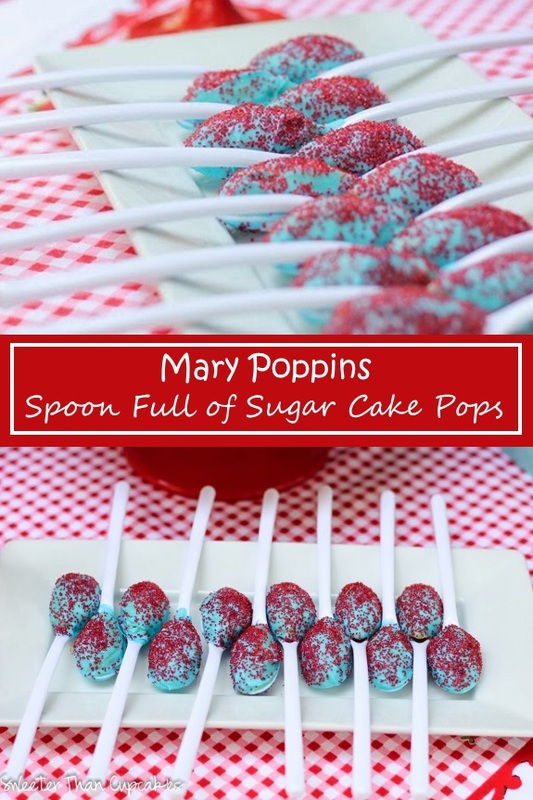 This is how I created these spoons full of sugar for our Mary Poppins party. These are by far the most comprehensive instructions I’ve found for making cake pops, so start there with your preparation. Once you have the cake pop mix, form the mix into balls and place them on a cookie sheet. Freeze balls for 15 minutes. Shape the lightly frozen balls to match the spoons you are using. Place the spoon shapes back on the cookie sheet and place in the fridge while you melt the candy melts. Melt 12 oz candy melts with 1 tsp shortening. Dip the shaped ball lightly into the candy melts and position on spoon. You just want a small amount of the candy melt on the underside of your shape. This should help the ball stay attached to the spoon for dipping. Return the spoons to the fridge for 15 minutes for the melts to harden. Then, let them sit out on counter 5 minutes. Press the spoons into the melted candy melts (reheat as needed) and twist slightly to cover the edges. Gently lift the spoon from melts. You may need to swipe away any trailing candy melt with your finger. Immediately, sprinkle with colored sugar or sprinkles. Store in an air tight container. I made mine 5 days ahead of time and they were great! This is such a great idea. I love cake pops. I just didn't realize you never baked them. Thank you for sharing this tutorial. I love this! A very realistic idea for doing cake pops. I have never made them because of the time that goes into them- the shaping, and dipping, and then decorating... all for something you pop in your mouth! But these I would definitely do! I have been telling my sister-in-law about your cute party. She thinks some of the stuff people do for their kids is a little crazy, but all your ideas are super doable! It is a little crazy, but I only do it because I love it! It's not worth it otherwise. I also did a couple things a day for over 2 weeks, so nothing is overwhelming at the last minute. As far as the cake pops go, sprinkles disguise all sorts of flaws!! How fast do you have to be at dipping? Do the candy melts solidify quickly? First time attempt happening this weekend for coworkers enjoyment on Tuesday.